A gazillion new books. Oh yes. Well it seems to be a while since I did a post on new books. What? It’s not that long? Too bad because I just went crazy and BOUGHT lots of new books. That’s what happens when you have a crap day at work and it rains. You head straight to your nearest bookshop to make life a little better. So what did I get? All from Waterstones on their 3 for 2 promotion. Amazing that there were a number of sff titles included too (of which Erikson is one of my favourites). You may also notice that I am exactly a year late to the Wolf Hall festival but am looking forward to reading it. Plus I got I Shall Wear Midnight by Terry Pratchett – which was included in the ticket to his book launch. The Other Half Lives by Sophie Hannah – from Annabel who blogs at Gaskella. I have yet to read any books by Hannah but have heard great things. Do check out Annabel’s wonderful blog which has a very nice mix of books. I’m so happy that I won the prize in which all the books are historical mysteries, my favourite genre! I’m participating in Book Blogger Appreciation Week this year so I’ll be posting every day next week and looking forward to discovering lots of new blogs. The Bluest Eye is fantastic. I hope you enjoy Wolf Hall more than I did–I couldn’t get through it. Oh I love Jazz! Looks like you have lots of good stuff to plough through ^_^ I read a book a day in my 6 week holiday…Well, maybe not but at least one every two or three, it was heaven. Wow, a book a day is amazing! I wish I could have a 6 week holiday too! Congratulations on the awesome books! Happy reading! So many books, I’m a little jealous! I am looking forward to reading Wolf Hall myself.. um.. someday? And I really should pick up a Toni Morrison book. Wow what a great book loot I’m rather envious. 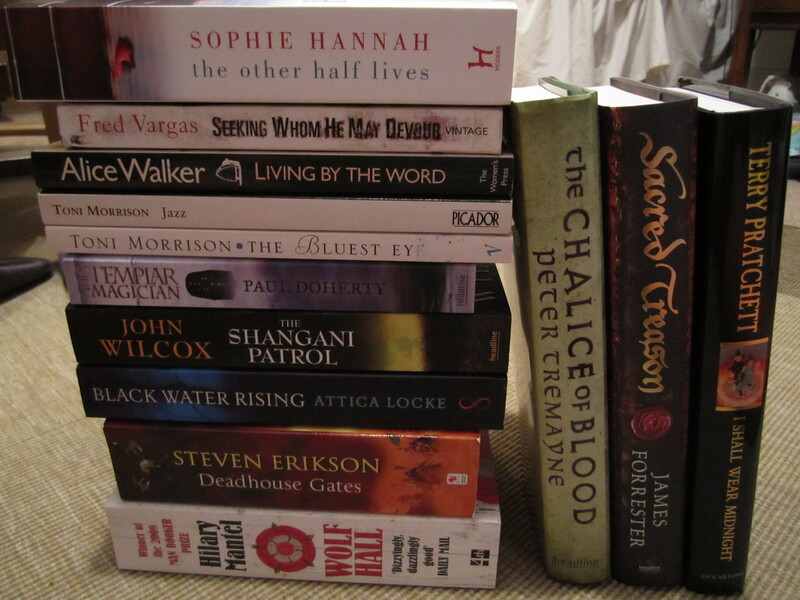 I’ve not had a loot like this in one go ever I tend to add to my tbr shelf little amounts but regularly. looks like a great collection. I’ve heard some good stuff about Jazz, so looking forward to what you think too. Congratulations on winning something special – thats always a huge buzz. Have fun with BB Appreciation week! I love the charity bookshop finds and the Sophie Hannah whom I am reading about on the blogs. I had a good day at the second hand bookshop (go see my list!!). Just returned from a 3 day break in Jaffna and lazily took Monday off as well. OOh enjoy the Hannah and Wolf Hall. I too am a year late to the Wolf Hall party! I noticed, and I’ll read your post properly once I’ve read the book! Thanks everyone! I haven’t read any Toni Morrison yet so am looking forward to trying out her books. And Wolf Hall is a bit of a chunkster but big books don’t scare me. Really, they don’t. i just finished reading The Bluest Eye last week and it was… interesting. good, thought provoking, but it’s going to take me a while to wrap my brain around how to write a review for it. and i’ll be reading Jazz in a couple of weeks, too. i need to pick up Wolf Hall and give it a shot before i’m the last person alive who hasn’t read it! and you’ve got a few that i hadn’t heard of in your pile that i’ll have to check out. great haul! Isn’t it weird how when you buy a book, you always find someone else who is also reading it at the same time? Especially when it’s not a new bestseller? I love that. I’ll bookmark your reviews for when I’ve finished Morrison’s books. And Wolf Hall? You’re not alone there! as for Wolf Hall, i’m kinda bummed that it didn’t get picked for the monthly October selection, but i’ll get around to it one of these days. it just sounds too good to be missed. i’ll keep an eye out for your review, too!